These are not your average gourds! 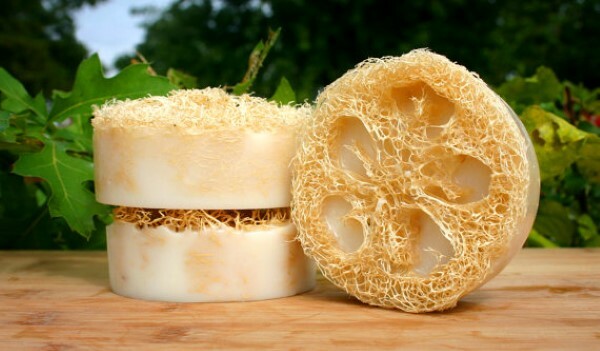 You can grow luffa gourds to maturity and dry them out to use as an exfoliating shower sponge. 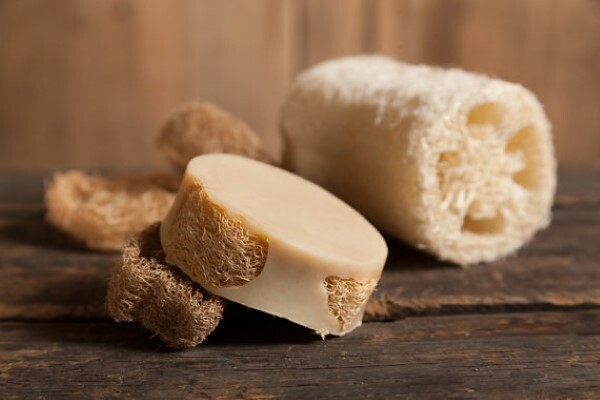 The natural fibres gently slough off dead skin as you wash, leaving you with softer, healthier skin. Not only that, but these gourds are edible too, so grow some extras to snack on as well. 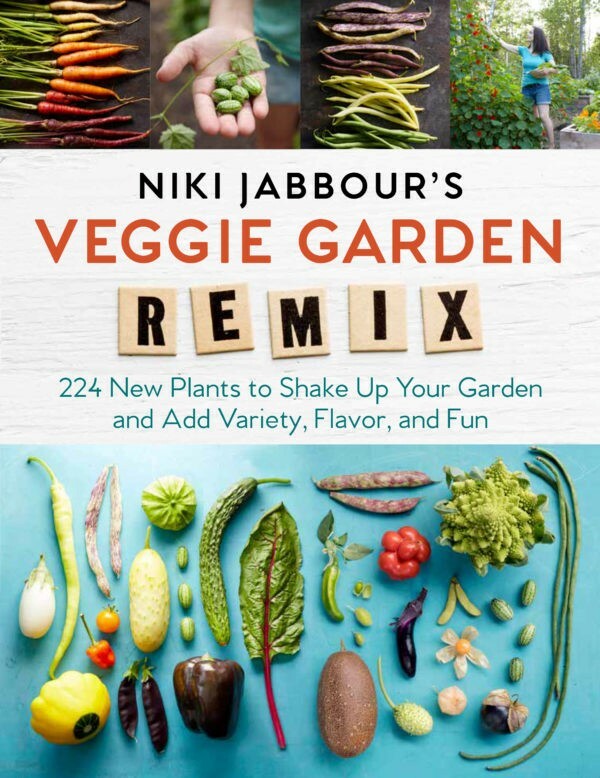 Luffa gourds are one of many unusual vegetables highlighted in Niki Jabbour’s wonderful book Veggie Garden Remix: 224 New Plants to Shake Up Your Garden and Add Variety, Flavor, and Fun. 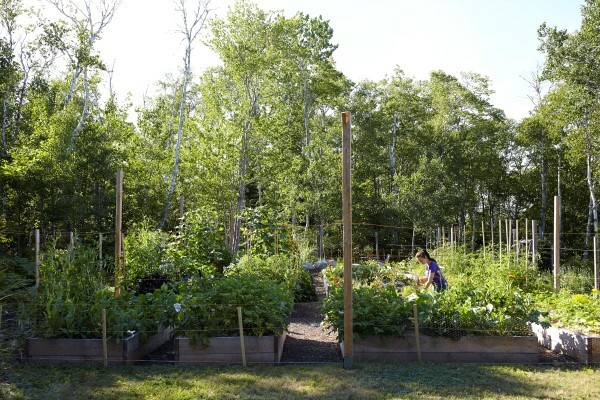 The book is full of different vegetables that most people haven’t grown in their home garden (or even heard of, in some cases) along with tips on how to grow, harvest, and use each of them. 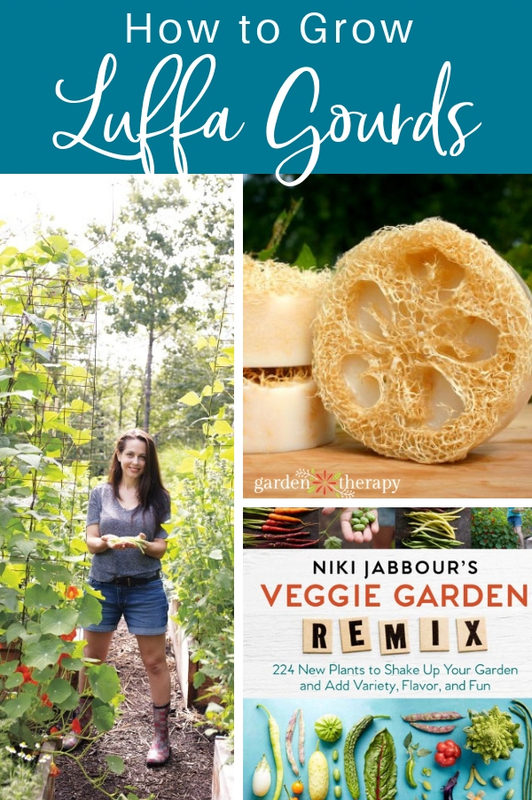 Read on for Niki’s luffa gourd profile, and grab a copy of the book to learn about 223 other exciting veggies to grow at home. And make sure you keep reading this post for a chance to win a free copy! When it’s mature, you can use it to scrub down in the shower, but when it’s young and tender, you can eat it. The flavor of the young fruits is similar to summer squash, and they can be cooked in the same way: roasted, stir-fried, stuffed, added to curry, or layered with cheese and tomato sauce in a savory parmigiana. You can even eat the very young fruits raw! 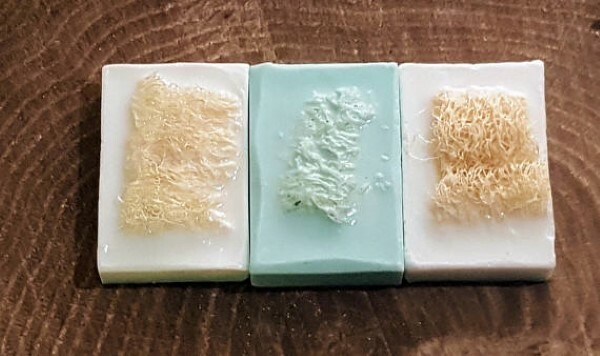 There are two main types of luffa: ridged (Luffa acutangula) and smooth, or common (L. cylindrica). Both can be eaten young or allowed to mature for their unusual sponges. 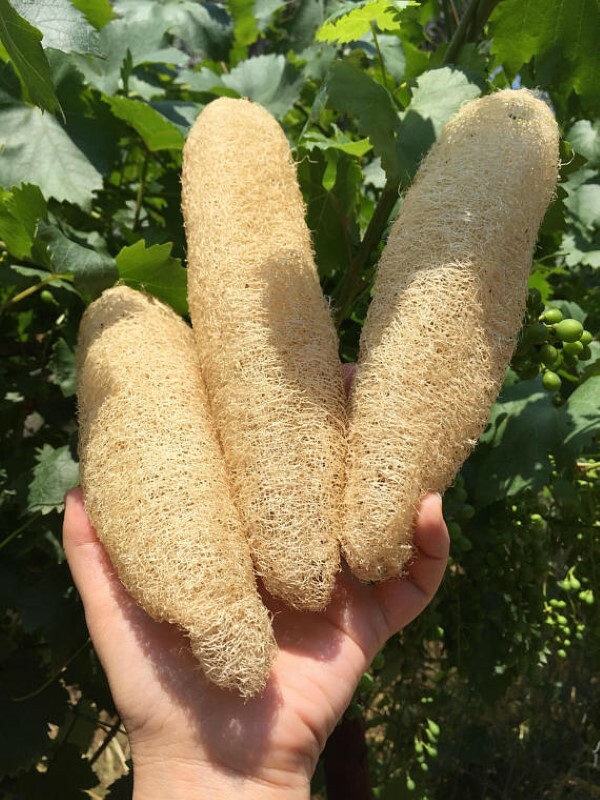 If you can’t decide which type to grow for eating, opt for the ridged luffa, which is generally thought to have superior flavor. are trying to take over the world”). You have been forewarned. Give them a fence or something very sturdy to climb. 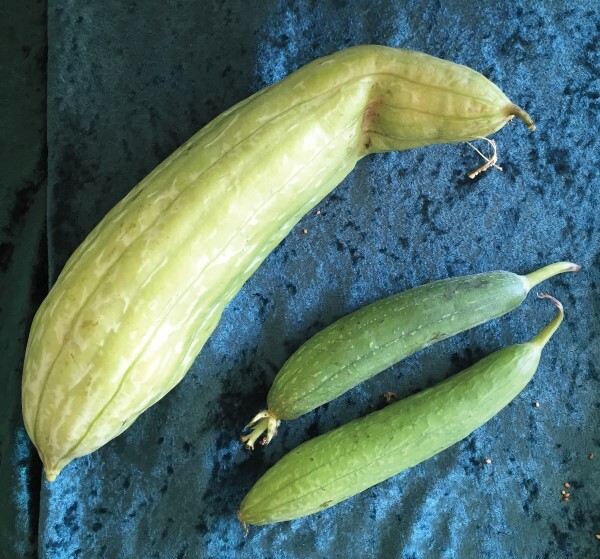 For edible fruits, pick baby luffa gourds when they’re just 2 to 3 inches long or slightly larger. But be sure to harvest them before they reach 6 inches in length, at which point they become fibrous and unpalatable. If you want sponges, let a few fruits grow to their mature size, up to 2 feet in length. In warmer regions, the fruits will ripen and dry on the vine. In my garden, I harvest the luffas when they are mature and the green skin has turned yellowish and bring them indoors to finish drying (a process that takes 2 to 3 weeks). Mature, dried luffa gourds. Photo by Etsy artist Kabajur. Once the skin is brown and hard, use a hammer to crack one end of the fruit and shake out the seeds for future harvests. Then soak the gourds in a pan of water overnight to soften the skin for easy peeling, which reveals the unique spongy interior. The fruits of the luffa gourd are a tasty treat when picked young, but once they grow longer than 6 inches, eating quality declines and they’re best saved for dried sponges. 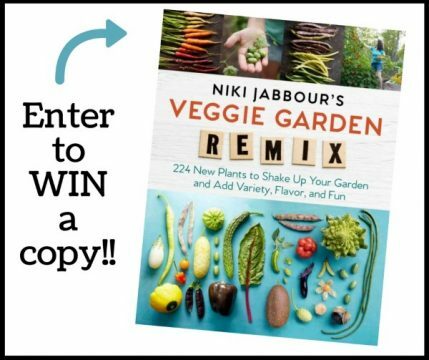 Niki Jabbour is the award-winning author of The Year-Round Vegetable Gardener (American Horticultural Society book award), Groundbreaking Food Gardens, and Niki Jabbour’s Veggie Garden Remix. She also writes for magazines across North America, including Fine Gardening, Birds & Blooms, Horticulture, and Garden Making. Niki is a popular speaker at shows, garden clubs, conservatories, and events. 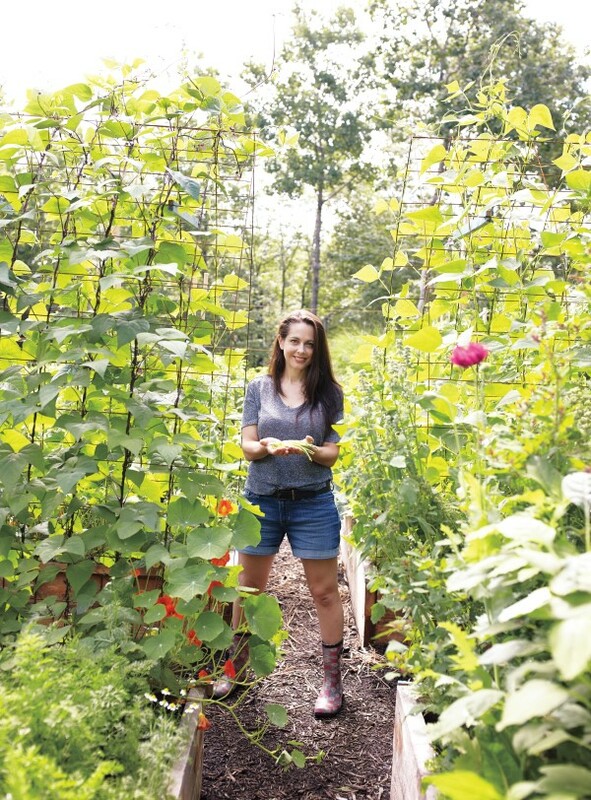 She regularly appears at the Northwest Flower & Garden Show in Seattle, Canada Blooms in Toronto, the Boston Flower Show, the Mother Earth News Fairs, and more.